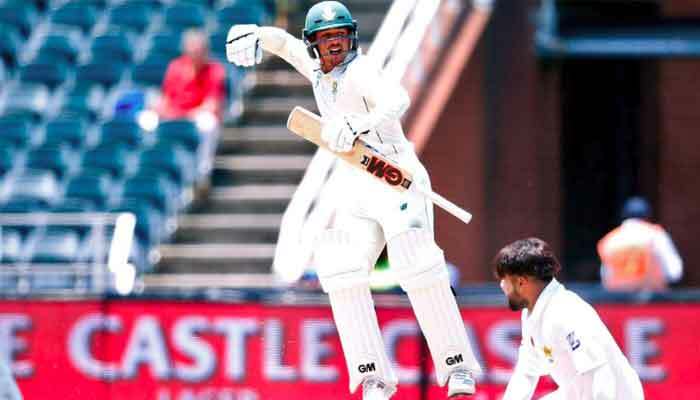 Johannesburg -Quinton de Kock hit an imperious century to put South Africa in a powerful position on the third day of the third and final Test against Pakistan at the Wanderers Stadium on Sunday, then warned that completing a series clean sweep would not be easy. De Kock´s 129 and a double strike by Dale Steyn kept South Africa on course but Asad Shafiq and Babar Azam batted brightly towards the close to give Pakistan some hope. "It´s going to be quite tough," said De Kock. "The pitch has flattened out. It´s definitely got better, surprisingly. I thought with the new ball it would do a lot more than it did." Imam-ul-Haq and Shan Masood got Pakistan off to their best start of the series, putting on 67 for the first wicket. They were largely untroubled by South Africa´s all-pace attack until Steyn changed ends and dismissed both openers in quick succession. When Azhar Ali fell cheaply to Duanne Olivier for the fourth time in the series, gloving a bouncer to wicketkeeper De Kock, a South African win seemed certain. But Shafiq raced to 48 not out off 47 balls, while Azam looked comfortable in making 17 not out. Realistically, though, the odds favour the home team with only captain Sarfraz Ahmed, a couple of all-rounders and the tail to come. "We´ll have a chat about it tonight. They have a couple of decent batsmen in the mix so we´ll have to box cleverly tomorrow," said De Kock. Pakistan bowling coach Azhar Mahmood said the remaining Pakistan batsmen would need to follow the example of De Kock and Hashim Amla, who enabled South Africa to recover from a precarious 93 for five. While Amla patiently compiled 71 off 144 balls, the left-handed De Kock played fluently as the pair put on 102 for the sixth wicket. De Kock also shared an eighth wicket stand of 79 with Kagiso Rabada. "Our plan was to get them out so we would be chasing 270-280 but credit goes to De Kock and Amla," said Mahmood, who said he remained confident. "We´ve done it before. Two guys are batting really well. If they can bat for a long period of time we´ve got a really good chance." Mahmood said at least one of the remaining batsmen would have to get a century. "If these guys do the same thing that Amla and De Kock did we´ve got a chance," he said. Mahmood agreed with De Kock that the pitch was playing easier but he cautioned that there was some uneven bounce towards the close on Sunday.